Indigenous people from Northern California and Southern Oregon are primarily the Pit River Indians, Modocs, Wintu, Karuk, Hupa, Shasta and Yurok tribes. Mt. 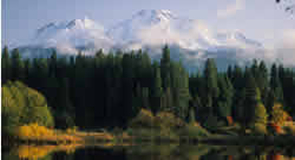 Shasta’s peak has been used as a spiritual and geographical locator. At 14,179 ft. elevation and an active volcano, Mt. Shasta towers above all other surrounding mountains. Native people do not reside on Mt. Shasta because it is considered so powerful. Spiritual ceremony is conducted in areas below the timberline and when finished, the surroundings are returned to nature, with nothing left behind. Medicine men and shamans are often taken to Mt. Shasta for training. There is much Native lore telling how the mountain has healed through prayer, songs, dancing, doctoring and through nature. The mountain yields a sacred spring and areas for collecting plants and herbs for ceremony and healing. The mountain is called ‘grandfather’ as it represents the paternal grandparents of the Pit River Tribe. Their powerful spirit called Mis Misa is said to live inside the mountain and serves to keep the universe in balance. They consider Mt. Shasta the beginning of all life and the end of all life, where one can ascend into the sky along the Milky Way to the beyond. The Native peoples report many tunnels within Mt. Shasta. The Wintu say the mountain generates sound that provides information and guidance. The Wintu lore says another realm exists inside the mountain and access might come through doorways, such as vents in caves. Mt. Shasta must be approached with great care and respect as it is guarded by certain spirits. Mt. Shasta is so powerful that only short visits are appropriate. It is said that “It has it all”. During ceremony, the Wintu frequently hear and know the presence of the “little people”, called the Mountain Boys, who live deep within the mountain. A shaman can communicate with the little people. The shaman also uses the bubbling brook on the mountain to gain spiritual information. When visiting the mountain, silence is important for meditation and fasting. The mountain spirits command respect. As early as the 1880s, writers began their association of the lost continent of Lemuria with Mt. Shasta. Even though these theories cannot be proved, the power of the mountain remains supreme. People worldwide visit Mt. Shasta to be close to its spiritual energy, to meditate, to communicate with the spirit world and to be healed. The concept of Lemurians living within the mountain has become widely popular and anyone visiting Mt. Shasta will be amazed by the abundance of literature on the topic as well as practitioners working within the vortex of an important spiritual community.